So how can we avoid thoughtless quests for information? 1. Know what you are looking for. Brainstorm for key words, using a few descriptive words as search terms. Have a idea of what format you want your answer to be in -- text, image, or video. Think about what type of site would have this information. Sometimes a general search engine is not the best tool. For a list of alternatives to Google, including search directories, metasearch engines, media indexes, search engines designed for kids, and even subscription databases, visit the Web Search Tools page on the faculty wiki. 3. Use Google modifiers to receive a more specific set of results. Limit by type of site (.com, .edu, etc. ), ensure a certain word or phrase is included (or not included) in the results, or find a quick definition. Click the image for a larger view. 4. Evaluate all results critically. RADCAB is a handy mnemonic that helps researchers consider important questions to ask of all resources (print and digital). 5. Reflect. Did you find the answer to your question? Modify the original search query as necessary. Consider an alternative tool. A simple way to have students practice search skills is to ask them find a website that supports the current lesson topic. 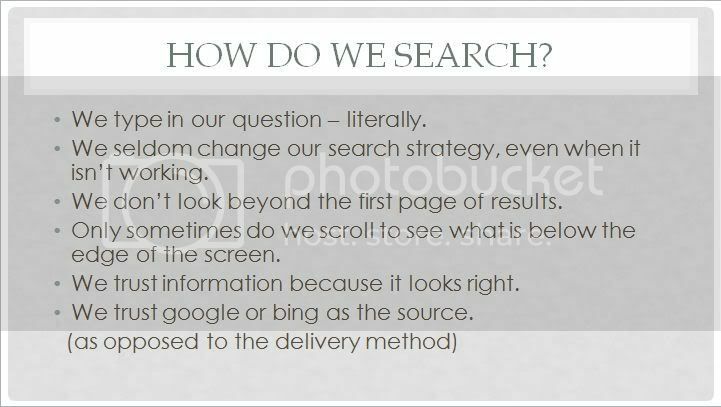 Have them list their search strategy (search tool, search terms) as well as explain why the site is related to the topic, reliable, and a valid source of information. Share this annotated list of student found resources on your class page, using them as a resource for class activities or extended learning. For help incorporating good search practice into your classroom activities contact Mrs. Bond. There are many simple ways to help students practice the important skills of developing a search strategy, analyzing a result set, modifying a search strategy, evaluating text, note taking, and citing sources.